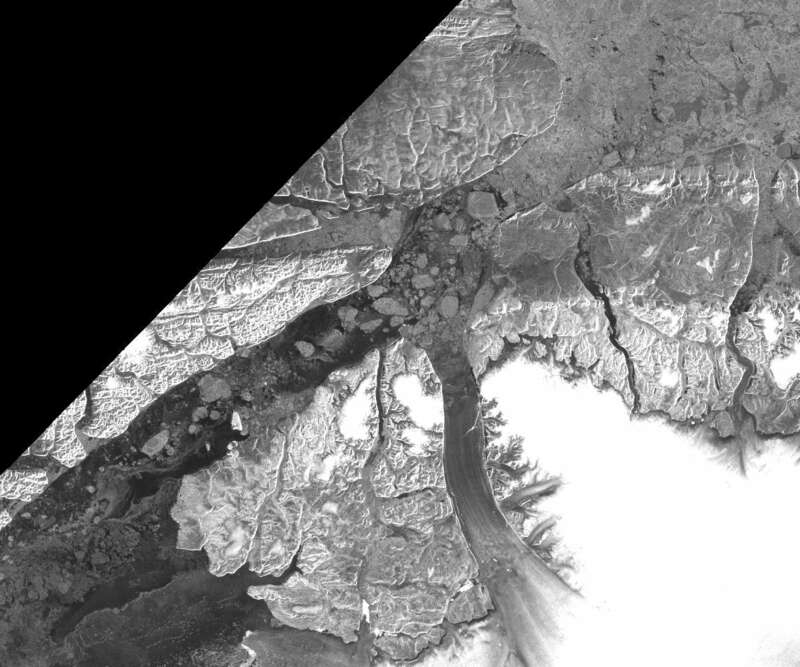 Sea Ice News #28 | Watts Up With That? I missed doing a Sea Ice News last week due to being a bit discombobulated with family health issues which have now thankfully been resolved, so I’ll pick up here with a new report. There is more ice in the central Arctic this year, but less in the Beaufort Sea, Canadian Archipelago, and Baffin Bay. These areas roughly balance each other out. 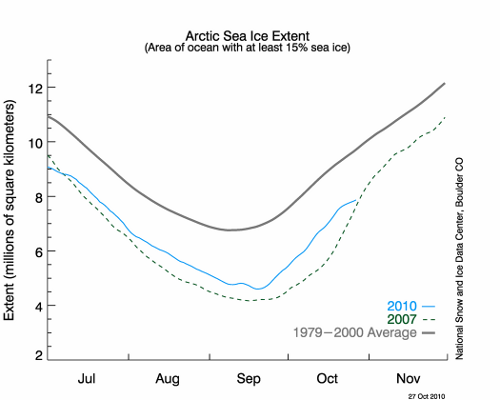 October 31, 2010 in Sea Ice News. Comparing the slowing seen recently on the JAXA graph to the DMI 30% graph, it is suggestive of compaction due to wind or currents. It looks like wind and/or currents eased yesterday as the rate increased on 10/30 and the initial JAXA value for 10/31 suggests this change is continuing. Arctic air temperatures seem to be normal. Must be warmer sea water coming in. Whats changed? The question is, does any of this mean anything for next year’s performance? Could you add the annual means, one horizontal line for each year (or a separate “Annual Mean” vs “Year” x-y plot)? The annual mean plot could be extended backwards to give an indication of context? That’s very interesting. It says that 2007 was not anywhere near as bad as it was made out to be. That’s not exaclty an assurance of certainty. When Greenland melts Europe freezes! I could have sworn I saw a sensor issue the day I first saw the dip in the NSDIC sea ice chart. I wish I had taken a screen shot of it now, but there was a big chunk of gray on the picture of the sea ice that day too. I’ve been expecting a correction in the chart but none has ever occured. Now you’re just buying what Walt’s trying to seel you, why? Thats good insn’t it? The warming since the Little Ice Age is almost getting back to where the Viking farms are no longer covered by ice. Maybe farming will be viable again in 50 years. One can only hope! I’d also welcome any comments or responses to the article that Louise linked to. Little more on that gray chunk: It looked like a pie wedge and it was near Greenland. I can’t remember how far into the Arctic the tip of the wedge went, but I felt it was enough of a chunk that it would cause that major dip that no other chart showed. And it looked like the sensor error they had this summer. Pascvaks – you say that when Greenland melts, Europe freezes. Not all of these can be true – I’d like to know what the site host actually believes with respect to whether the planet is warming or not (regardless of cause) and whether that will have a positive or negative impact on our western society as it currently exists. The extent of Greenland Sea ice cover has dominant cycles of 74 and 24 years, the same cycle periods as the residence time for Deep Water and Atlantic Water in the Arctic Ocean. The close relationship confirms that the Greenland Sea ice cover is governed by Arctic outflow. Seems like the eastern Canadian Arctic is experiencing above average air temperatures again this autumn. With a clearer understanding of the site’s perspective on such issues, a lot of redundant discussion could be eliminated. I’d love to see an FAQ for such topics, so that posters could be referred to a standardized response to common issues. On the other hand, the site does bill itself as “commentary on puzzling things in life, nature, science, weather, climate change, technology and recent news”. The focus is on commentary – not on resolution. WUWT does a great job of presenting several thought-provoking commentaries every day, but it might be beyond the scope of WUWT (or its readers) to try to actually reach any conclusions or to come to any consensus on these puzzles. That could partly be due to the fact that the image of 2010 is significantly larger than in 2007. A quick estimate from measuring images on the screen shows that 2010 is about 5% bigger in diameter and hence about 10% bigger in area. If the two areas are indeed similar, but the 2010 image is 10% larger in area, that would be a major factor in the 2010 area looking larger! As I read it he (Walt) wasn’t selling anything. He pointed out that since th CS images are looking at a 2D representation of a sphere, the pixels farther from the pole have lager area’s because of the projection of curvature onto the view plane. 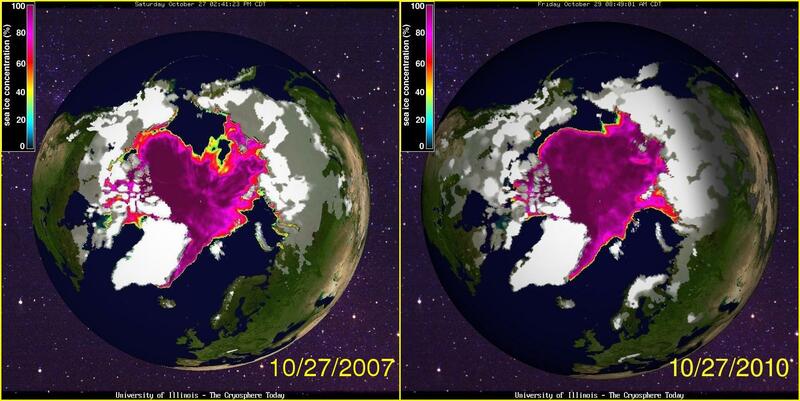 2007 had more ice near the periphery so a visual comparison isn’t going to be accurate. You need to look at the numbers. Is everyone now agreed that the cryo ice data is rigged by AGWers from 2007 onwards? 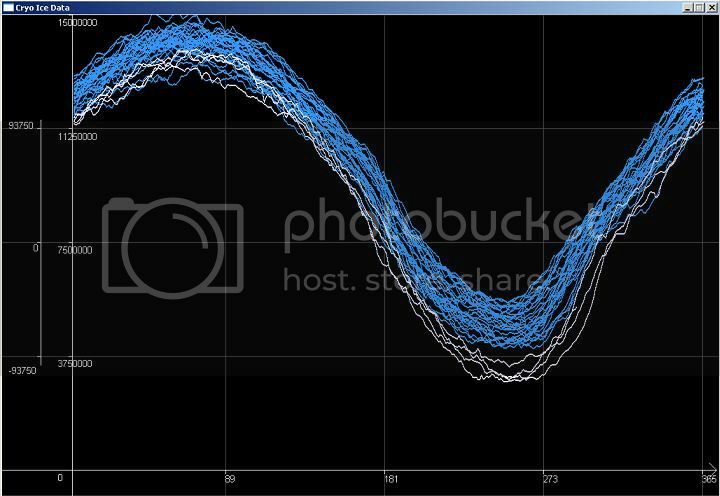 it’s apparent that 2010’s Arctic sea ice area is 14.7% higher than 2007’s according to the most recent numbers. They aren’t really different sizes. The image on the right appears to be bigger because more of the globe is included. If you measure the size of Greenland in each image, they are identical. Also, if you look at the “rim” of each globe, you will that the image on the left shows less area than the one on the right. We are entering the relatively uneventful period of arctic ice extent of November and December, during which accurate guesses appear possible based on the JAXA data for 2002 through 2010. The JAXA data show that the average November and December increases are roughly the same at 1.9 million km2 , with January showing a reduced average increase of 1.1 million km2. The variation in annual extent diminishes at this time of year, particularly in December, resulting in a “choke point” since the arctic ice extent is influenced as much by geography as it is by conditions. The October 31, 2010 extent was 8,038,906 km2. While the first 15 days of October averaged almost 100,000 km2 increases per day, this slowed for the last half of October to under 70,000 km2 per day. 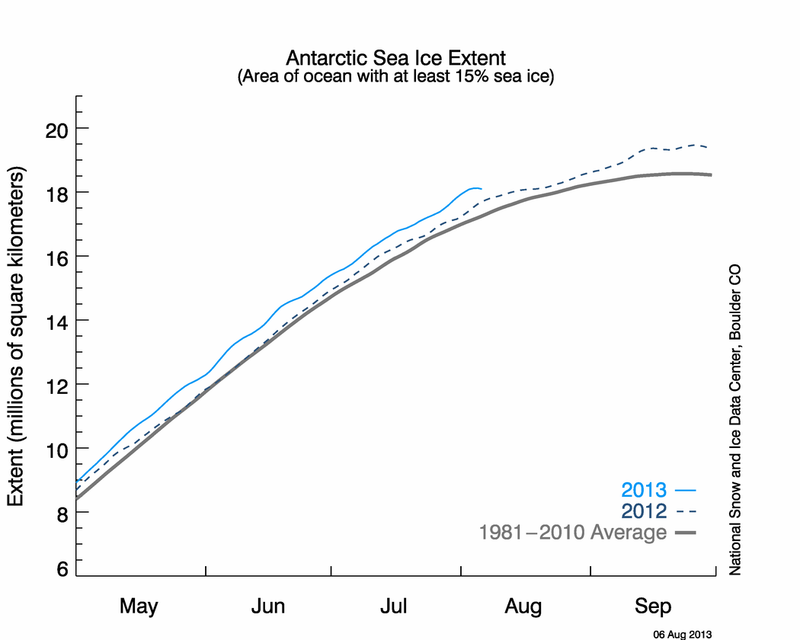 The current state is comparable to the October 31, 2007 ice extent of 8,003,281 km2. Based on the numbers in the JAXA data set, November 30 should be in the 10.1 to 10.3 million km2 range given the low level of 8.0 million km2 for October 31 and the average increase for last 3 years of 2.1 million km2. The largest November increase in the 8 year period of the data was 2.25 million in 2007. While November of 2008 reached 10.7 million km2, the highest value since 2004, the 2008 November number was “helped” by the high October 31 values of 8.9 million km2, therefore it is unlikely that November of 2010 will reach the 2008 level. December 31 should be in 12.2 to 12.4 million km2 range since all 2004 through 2009 values fall in this range. The values for 2002 and 2003 were approximately 12.7 million km2. Both of these years were helped by high values at November 30 of 11.0 and 10.6 million km2 respectively. January 31 should be in the 13.1 to 13.7 million km2 range as all values since 2004 fall in this range. The wide range of possible numbers for January diminishes the value this guess. The value for 2003 was 14.0 million km2; however, it was “helped” by the high December 31 2002 figure of 12.7 million km2, the highest December amount for this period. Predicting ice extent 3 months in advance is not very accurate and further guesses of the arctic ice extent after January is not prudent or meaningful as the range of values is too large. For the antarctic, the value at October 31 was .371 million km2 above the average, which represents approximately a 2% difference from the 1979 to 2000 average average ice extent. This difference is a significantly smaller than the percentage difference experienced in the arctic. The University of Bremmen chart does not appear to show much annual variability from the average for the next month. Based on the chart, the November 30 antarctic ice extent should be closer to the average than the anomaly for October 31. I consider such reports to be prepared by honest people trying to present good data. On the other hand you can disregard any of the “record-setting statements with a “So what?” shrug. There are several ways to consider the issues. One, is that the area has been warmer before (remember the Greenland settlements?) and Earth did not tip to irretrievable toast. Two, Greenland became colder (LIA ?) and has rebounded from that and is still doing so. Thus, the trajectory of the LIA rebound could have several looks: upward line with dozens of ups and downs but cumulatively up; or the line could look like an upward wave. Three, Greenland and surrounding areas could be responding to the volcanic eruptions during the past year. Four, the several hurricanes in the Atlantic could have added to the warmth in the northern part of that ocean and the result could be warming around and of Greenland. And there are several other possibilities. One of the events mentioned in the article was the breakaway of the ice-island from Petermann Glacier. Is that something to be feared, an omen of bad times ahead, or just something that happens as the weight of the glacial ice causes downslope movement into the sea? What happens when a brittle ice sheet floats on a surging sea? There have been times in the past when more icebergs than now floated into the north Atlantic Ocean. Bottom line: The reports and numbers in this and similar articles are interesting and establish useful data sets but without context and explanatory mechanisms they do not suggest any dire threat to the planet. Final note: The “Anecdotal Data” presented at the end is the sort of thing often mentioned on WUWT as “weather and not climate” and hardly qualifies as “Data.” I can tell you about all the green tomatoes grown in my neighborhood this season and the thick coats on the horses. We are laying in firewood — expecting a cold and snowy winter. Send lots of money and I will report back next May. They aren’t really different sizes. The image on the right appears to be bigger because more of the globe is included. > If you measure the size of Greenland in each image, they are identical. When I zoomed in close, and measured Greenland “from tip to tip”, I got a slightly bigger size in 2010. >shows less area than the one on the right. I can see a few pixels past the Mediterranean Sea on both. I can see the same tiny bit of Florida on both. I can see the same strip of sea beyond Japan on both. From all I can see, the same part of the earth is included in both. And by looking at the starry background and the legend, it is easy to see the disk for 2010 is larger. And as has been pointed out, the images are not equal-area projections. it is not at all surprising to me that the graph and the images might seem to tell a slightly different story. I saw the same gray spots on the map a few days ago like Karen mentioned above. That is why I thought there was possible sensor/math issues. The smoothing may make the line not dip like it should. Hmmmmm. “As you can see above, after making a very fast recovery during most of October, it is now pacing the 2007 rate. This isn’t terribly unusual, as you can see a “choke point” beginning in early November where the rates of formation start to converge”. Suddenly the rate of sea ice formation starts to slow, so there is an automatic statement to say that this is not unusual … based on a very very limited time series of data. It would seem that any arguments that favour signs of warming are frowned upon (even if it is natural). Geological evidence shows that the planet has been a lot warmer in the past but is that any excuse to ignore what is happening now? Science is about looking at data objectively and both sides of the climate change argument are guilty of not doing so! Thats for sure below Eureka,Ca, which has seen some temps down to 25 below (F) but while we wait for a cool down there, there is plenty of cold now on both the East & west side of the Arctic…The hole down to the mouth of the bering straits & along the AK coast should be filling in Rapidly. This makes the Skier in me..HAPPY!…There will be winter after all…Bah Humbug to the Bugs on this thread..
>Arctic extent has reached its highest number for this date, exceeding 2006. It looks like Anthony jinxed the ice! The DMI 30% extent went from the highest on record (in a record that goes all the way back 6 years) to the 2nd lowest. Other measures seem to be following suit – putting the extent somewhere between 1st -3rd lowest ever. Anthony can feel free to edit in and correct me, but since you have yet to be answered, I’m going to give you the Q&D. Having read almost all of the articles and most of the comments on this site since Mid 2009 (right before ClimateGate), the opinions of the site admins, as close as can be described is as follows. 1) The Earth is warming, in a cyclical nature, since the end of the LIA. 2) The temperature patterns, warming rates and climatic events seen during this warming event are NOT unprecedented and warmer periods have existed in both the near and distant past, with both higher and lower concentrations of CO2. 3) The warming that is occurring is not catastrophic, nor is there a strong likelihood of positive feedbacks which will turn minimal CO2 driven or natural warming into severe, deadly warming. 4) The records, data, hypotheses, predictions and warnings of the “in crowd” of climate science is highly questionable in many cases, especially many of the most well known and often cited cases. These cornerstones of Climatology (positive feedbacks, CO2 “control knob”, tropospheric hot spot, “unprecedented” *anything*) are poorly understood or blatantly unsupported by the ACTUAL real world data, which is subsequently ignored by the people who believe in these things. 5) No one (reasonable) on this site says that it’s simply NOT warming. It hasn’t warmed for about 10 years, significantly, and we may be entering a solar driven cold snap/ice age, but no one (reasonable) argues that temperatures since the 1820s-1850s have risen significantly. It’s called coming out of an Ice Age, and it can be considered PERFECTLY normal, taken out of the context of CO2 driven hysteria. 6) In the past, warming has by and large HELPED human society, while cold has hindered progress and injured health. Any medical professional can tell you that extreme cold provides more stress to the body than extreme heat. By viewing through this lens and looking back at periods like the Roman Warm Period (a period of cultural and societal growth and prosperity) and the Medival Warm Period (when we dragged our collective butts out of the cold driven Dark Ages) we can see that 1-2 deg celsius of warming is MORE LIKELY to benefit humanity than hinder it. 7) The Global Warming markers we were told to watch for (glacial melting, sea level rise, intense weather anomalies) have not occurred at abnormally high or unusual rates for after a glacial event (LIA) with the exception of soot (BLACK CARBON) driven melt. This is an effect of having a directly absorbant material, caused by incomplete burning of fossil fuels and isn’t directly related to CO2 (new cars and clean factories produce no soot). Good questions Louise, but impossible for anyone to answer – WUWT! Our climate is driven by many, many interlinked mechanisms which have the effect of acting together to keep the climate oscillating around the comfort zone of the biosphere over long, long periods. These mechanisms produce turbulence and deterministic chaos, which means they are non-linear at looking at trends to predict the future climate regime is useless. It does not behave as a global system, rather it operates as a conglomerate of many small regions and it is possible for some to be warming and some cooling at the same time. Over the last 15y there has been no statistically significant change to our averaged global mean surface temperature, despite a large increase in CO2 over this period. So it looks like GHGs are at best a minor player in climate – the hydrological cycle has a much bigger effect. Regarding Arctic sea ice, Arctic-ROOS are showing that 2010 has been closely tracking 2009 since October – seems that climate science doesn’t have a consistent and accurate Arctic data-set yet (see link below). Thanks to NovaReason & Tenuc for trying to answer Louise’s question. Part of the point is that if there WERE such a summary in some prominent place, we wouldn’t have to guess and/or read between the lines thru years worth of posts to know the general views on specific topics. People who different significantly from WUWT (in any aspect) could be directed to a clear summary as a starting point for discussion. As it is, the same discussions keep popping up in many various threads. For instance, it was stated “No one (reasonable) on this site says that it’s simply NOT warming.” But you DO hear that claim here – sometimes it refers to the last decade; sometimes the last century; sometimes the last millennium. It would seem perfectly reasonable to have a summary of the “official” views of WUWT on key basic issues. Over at Skeptical Science they may be a bit over-zealous in the other direction. Many posts are greeted with a simple message from the mods to the effect “Read this other thread to see what we think and THEN comment on specific issues you have.” That might stifle some discussion, but it also prevents rehashing the same issues over and over again. Nice summary. I would like to add to that…there ARE in fact several commentors on here who claim no warming over measurable periods, no GHG effect, etc. Reading comments on other sites (e.g. Tamino’s) might lead one to believe that this is the majority belief (as well as Anthony’s) on WUWT. From my experience, that’s not the case. Yes, there are those people here, but there are also CAGW believers here too. I’m now a fan of Novareason..with kudos to Kenuc… & u always da man Scott….Anybody watching the ice grow?? Anybody watching the ice grow?? Thanks AJB For giving me a small , though pretty much insignificant …whats the word?….never mind…Does anyone notice how cold it has to get to get ice to grow over at Svalbard,norway? ?…Been cold enough since the 23rd of Oct & some periods before that but….NADA!…Gotta be that Gulf Stream. Question: What is going on under here? What monitoring of the heat coming from these has been done since July 2004? Russian marine geologists discovered the Piips hydrothermal field in 1987. Temperatures of up to 130°C were measured, and hydrothermal deposits composed of sulfates, carbonates, amorphous silica, and other materials were discovered. Yes. My question now is – can we avoid reaching recorded lows for the upcoming days? 2007 is coming up fast in both extent and area, and we’re currently close to 2009, which has poorer performance soon. We just “got passed” by 2009 in area, but it has weak days Nov 4 & 5. 2007 then passes 2009’s area on Nov 5, so we’ll need to be ahead (and stay ahead) of 2009 by then. This will be tough b/c 2009 exhibits good area growth Nov 6-11, after that it goes to the crapper for 5 days. With extent, we’ve been trailing 2009 for about a week now. 2007 passes 2009 in extent on Nov 5 and passes it “permanently” on Nov 7. We’ll need to average additions of 118438 km^2 the next two days to not be the lowest extent on Nov 5. For reference, 2010 has picked it up recently, averaging 140625 km^2/day the last 4 days. Before that, however, was some pitiful growth that got us into this problem in the first place. If we can stay ahead of 2009 until Nov 7, I expect to stay ahead of it in extent for quite some time…probably long enough to reach the section where 2006 is the poorest on record. Also, for those interested in monthly averages, 2010 was the third-lowest (above 2007/2009) in both the JAXA extent and CT area records. I haven’t pulled the NSIDC numbers yet, but it typically agrees with CT. The Petermann Ice Islands are on the move again. 2007 is coming up fast in both extent and area, and we’re currently close to 2009, which has poorer performance soon. We just “got passed” by 2009 in area, but it has weak days Nov 4 & 5. 2007 then passes 2009′s area on Nov 5, so we’ll need to be ahead (and stay ahead) of 2009 by then. This will be tough b/c 2009 exhibits good area growth Nov 6-11, after that it goes to the crapper for 5 days. As of this morning on JAXA the extent is now lower than 2007 (I find ‘ahead’ and ‘trailing’ etc. confusing since they appear to depend on the viewpoint of the poster). You looked at the preliminary number, which is nearly 100% of the time lower than the final number this time of year (from my observations, often by around 30-60k km^2). 2010 ended up higher than 2007 for 11/3. To be higher for 11/4, it’ll need a single-day gain of 87969 km^2. To avoid being last (above 2009) for 11/5, it’ll need to avg 83828 km^2/day for two days, and to avoid being last for 11/6, it’ll need to avg 78855 km^2/day for three days. I think the probability of achieving all three of those is a toss up, maybe 50/50. Yesterday’s CT area number showed a 142k km^2 increase, putting 2010 in a good position. It’s already above 2009 for two days ahead of it, so as long 2010 shows even average gains the next two days, it’ll be in good position to hold off 2009 during the four days after it (and even the 3 days after that), where 2009 shows very good gains. NAO is going Neg…The Arctic Temp is a little above Ave….But we still have some easy real estate to grab while we tackle the hard spots that require extreme cold. Hudson Bay will be the new hunting grounds as we wait for the bering straits to fill in….its all good & the west va alpps have just entered into the Northern hem snow extent..
http://www.natice.noaa.gov/pub/ims/ims_gif/DATA/cursnow_usa.gif?session-id=0b80eb435d423e1655296157e8912f34…See the little White dots? Yes but it’s really hard to follow when the commentator doesn’t appear to be sure which way the race is going!
. To avoid being last (above 2009) for 11/5, it’ll need to avg 83828 km^2/day for two days, and to avoid being last for 11/6, it’ll need to avg 78855 km^2/day for three days. So last is ‘above 2009’. putting 2010 in a good position. It’s already above 2009 for two days ahead of it, so as long 2010 shows even average gains the next two days, it’ll be in good position to hold off 2009 during the four days after it (and even the 3 days after that), where 2009 shows very good gains. By the way today’s revised numbers on JAXA show 2010 lower than 2007 but slightly behind 2009 (statistically more like a dead heat for all three). To avoid being last (above 2009) for 11/5, it’ll need to avg 83828 km^2/day for two days, and to avoid being last for 11/6, it’ll need to avg 78855 km^2/day for three days. So last is ‘above 2009′. In fact, I used your advice in that comment in my next one, thus adding the word “above”. Now, I freely admit that my sentence was ambiguous with the word “last”, and if I was reviewing a paper I would probably request that sentence be reworded to remove the ambiguity, though I probably would not imply that the writer “doesn’t appear to be sure” when they obviously exhibited clear quantitative numbers (which you could easily verify) showing that they knew what they were talking about! However, despite the ambiguity in my sentence, I feel that the word “above” cleared it up fairly readily, as it is unambiguous. …it appears that it’s pretty easy to make this error. Indeed typing “ahead” (apparently off limits) into Microsoft Word (2008) and using its thesaurus feature provides the recommended antonym of “behind”, so I don’t understand how one is acceptable and the other isn’t. So is a case of the pot calling the kettle black, or is it simply just very easy to make this sort of mistake? I’ll go ahead and assume the latter for now, even though this courtesy didn’t appear to be given to me. Words such as ahead/behind/leading/trailing are ambiguous in the present context and should be avoided. Instead, words such as above/below/higher/lower/greater than/less than are much clearer and should be preferred. So I had been worried about 2010’s area (from CT) becoming the lowest on record (for any specific day) this week. However, 2010 showed well above average gains in area the last several days, placing it well above 2009, and somewhat higher than 2007. 2009 shows large gains the next week, while 2007 shows a large gain for 11/06, then several days of lower gains. It looks like 2010 is positioned well to stay above both for at least the next several days…and it won’t be long before all three years catch 2006 and should stay well above it after 11/21 or so. 15% Extent (JAXA) is a bit of a different story. Yesterday’s gain in JAXA was very low, and an equal day today will put 11/06/2010 as the lowest on record. 2010 will need to gain at least 64063 km^2 today to avoid taking that title from 2007, and it will need to increase by 58047 km^2/day for the next two days to avoid going below 2009 in two days, after which the pressure decreases for a couple days. If 2010 can stay above 2009 through Nov 10, then it is likely it will avoid setting a record low for another week and a half. Has anyone cked out the plume of Heat/Moisture streaming up from Hurricane tomas?..This heat will delay some ice growth in the sea between Greenland & Canada (& probably affect Hudson Bay)….All this heat will go Bye bye & even though the Ice extent might dip below 07 …(Or Might not)… in the long run we be sittin pretty!..Word! We will almost certainly see 2010 go below 2007 soon…its extent and area increase rapidly this month. But the question is whether we can consistently stay above 2009 and later 2006 to avoid being the “lowest on record”….although Phil was right earlier in that statistically they’re all pretty much equal. Preliminary JAXA number for 11/06 shows a loss…nearly guaranteeing that the final 11/06 number will be the lowest extent on record. Blink back & forth from 11-5 to 11-6 & you can clearly see ice gain..WUWT? This is kinda indirectly related to Ice extent & it does disturb me somewhat so i have posted it. On some other Blogs you can start new subjects which is what i would have done instead if able. As you can see we had a great Start to Snow Extent but we are way in the Neg right now & on top of that I see Air temps over on the Red/Neg side as staying above ave for maybe 8 plus more days. In fact I see f-casts for temps as high as 20 degrees above normal…Temps up in the 50’s where they should be in the 30’s..& No Snow! I’m sure it will come around & mama nature will even the score but I’m getting nervous…as you can see by my handle..I need SNOW! fruits of my F-cast….You DOUTED ME????! !..Love my thread…Stay tuned! This graph lags by 3 days so you can see that we are almost back to norm now..I’m Done..Time to move over to Sea ice news 29.